Steven Joshua Wiggins, a man suspected of fatally shooting a sheriff's deputy, is seen in police custody in a photo released Friday, June 1, 2018. 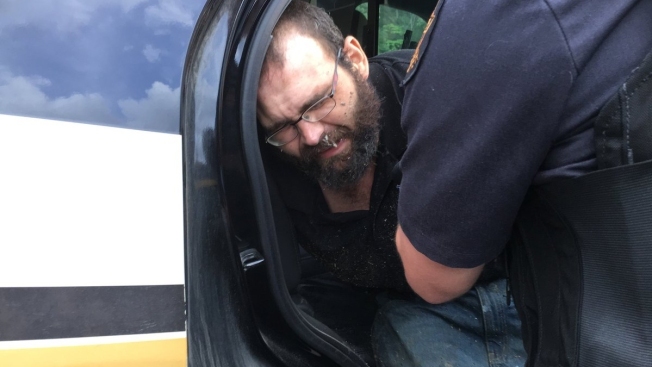 The Tennessee Bureau of Investigation tweeted photos of a handcuffed Steven Joshua Wiggins, grimacing as he was placed into the back seat of a law enforcement vehicle. His clothes were muddy and his jeans were ripped. Authorities said Wiggins was being booked into jail wearing the handcuffs of Dickson County sheriff's Sgt. Daniel Baker, who was found dead in his car Wednesday. Trooper Kevin Burch was driving down a road Friday morning when he saw a man near the edge of the wood line matching the description of Wiggins, who has tattoos on both arms, Tennessee Highway Patrol Col. Dereck Stewart said. He approached the suspect, who was considered armed and dangerous, with his service weapon drawn, but Wiggins was "totally obedient" as he was arrested, Stewart said. Baker was killed after responding to a call about a suspicious car Wednesday, the TBI said. Dickson County Sheriff Jeff Bledsoe said "everything escalated from there once he discovered that the vehicle was reported stolen." Baker couldn't be contacted for some time, but the deputy's car was eventually tracked by GPS to a wooded area 2 or 3 miles (3 to 5 kilometers) away. The deputy was found dead inside it. The car was moved there "by the suspect's actions," Bledsoe said. "He was able to hide for an extended period of time," Stewart said. It's not clear where Wiggins hid or how he evaded authorities. Baker, who also served in the U.S. Marine Corps Reserve, is survived by his wife and daughter. Bledsoe said his agency lost a brother, and the community lost a hero. The sheriff broke down as he read a statement from Baker's wife thanking law enforcement and others for the manhunt. "I would like to ask our family, friends and community to help our daughter, Meredith, to always know how wonderful and amazing her father is," the statement said. "His service and dedication to his country and community will always be remembered." That woman was in the car with Wiggins when he pulled the trigger, and is now jailed on a murder charge in Baker's death, according to court documents. Castro-Miles also told police Wiggins had been "doing meth all night and smoking marijuana." The next day, she was sitting in the car with Wiggins when he shot the deputy, according to an affidavit filed in Dickson County court. She fled the shooting scene Wednesday and hid under a house, the affidavit says. Now she's in the Dickson County Jail. Both Wiggins and Castro-Miles are being held without bail, the district attorney's statement said.